Tax departments with company facilities in high electricity cost markets can help their facility’s managers to use Energy Policy Act (EPAct) tax incentives for new thermal storage systems and for further expanded Heating, Ventilation and Air Conditioning (HVAC) tax incentives related to existing thermal storage systems. Thermal storage systems make ice at night during off peak hours when rates for electricity are typically cheaper as opposed to daytime peak hours when electricity costs (particularly in high cost electric markets) are substantially higher. Throughout the nation, there are major areas that have a difficult time producing enough electricity during the daytime summer periods when the demand for air conditioning use is the highest. The EPAct tax provisions astutely encourage property owners to overcome the electricity price differential by capitalizing on the so called time of day pricing difference with thermal storage systems. As set forth under the Electricity Section of the Energy Policy Act of 2005, each electric utility must offer each of its customers a time-based rate schedule1. Consequently, all US property owners have the opportunity to use time of day pricing to their advantage to avoid high electricity costs during peak time periods. Tax departments with large property portfolios need to be cognizant of when their respective facilities may be considering or have already purchased thermal storage systems. Some leading brands of thermal storage systems include Calmac (http://www.calmac.com/), Baltimore Aircoil (http://www.baltimoreaircoil.com/) and Ice Energy (http://www.ice-energy.com/Default.aspx). Because thermal storage systems save so much daytime electricity use, state and local utility programs will often provide large rebates for thermal storage systems. New thermal storage systems, particularly when installed with new high efficiency chillers and package units, are often eligible for tax deductions which can be achieved in either one of two ways. As discussed in one of our previous articles, “New Efficient HVAC Drives Large Tax Deductions for Buildings,” immediate EPAct HVAC tax deductions of 60 cents per square foot are available for achieving a 16.67% energy cost reduction compared to the ASHRAE (American Society of Heating, Refrigeration and Air Conditioning Engineers) 2001 building energy code standard. Another option for achieving a tax opportunity is a $1.80 per square foot whole building tax deduction when the thermal storage system results in the overall building having a 50% energy cost reduction compared to ASHRAE 2001 standards. Existing thermal storage systems present tremendous overall energy tax savings opportunities using the HVAC free riding concept. With free riding, any additional HVAC investment that either reduces energy usage or increases the energy cost reduction so that it achieves or exceeds a 16.67% cost reduction will qualify for the 60 cent per square foot tax deduction. 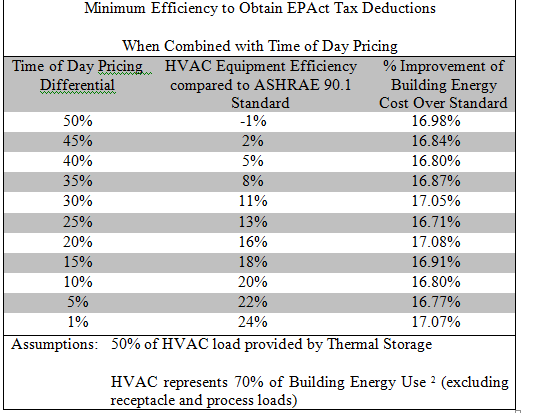 The chart below demonstrates how even small equipment efficiency improvements, when combined with Time of Day Pricing and Thermal Storage can generate the requisite cost improvement to qualify for the 60 cent per square foot tax deduction. Existing thermal storage systems in buildings at the 50% energy cost savings threshold can use the EPAct whole building free riding concept to obtain a 1.80 per square foot tax deduction for a wide range of further energy cost reducing investments. To utilize this opportunity, a new further energy reducing investment must occur during an EPAct year. Accordingly, tax managers dealing with facilities that already have thermal storage systems should give strong consideration to making further energy cost reducing investments before December 31st, 2013. Large scale storage systems are sometimes used in central plants supporting multiple buildings or district wide systems supporting multiple independent buildings. When thermal storage is used with these systems, there is an opportunity for tremendous HVAC and whole building tax savings for every building supported by the central plant thermal storage system. One of the most prominent examples of this type of large scale ice thermal storage system is the Northwind Phoenix cooling system in Phoenix, Arizona. This cooling system serves buildings ranging from 3,000 to more than 1,900,000 square feet3. 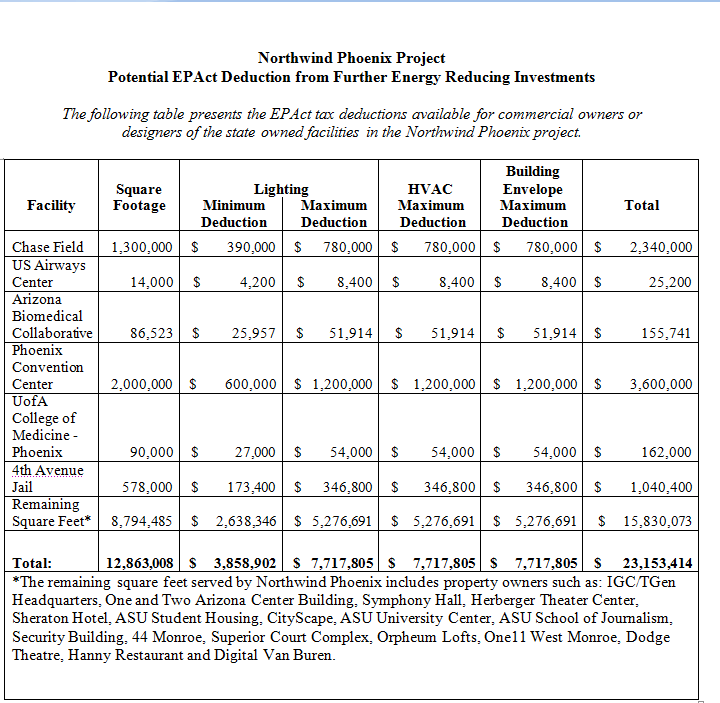 As of July 2009, Northwind Phoenix serves 12,863,008 square feet of Downtown Phoenix4. The Energy Policy Act of 2005 time of day pricing mandate means that time of day pricing electricity cost savings will be available throughout the country. This means that property owners who already have existing thermal storage systems or are contemplating thermal storage systems have the opportunity to obtain large tax deductions for qualifying building projects completed before December 31st, 2013. 2 2003 CBECS Detailed Tables. EIA.DOE.gov 2008. Aug 18,2009. <http://www.eia.doe.gov/emeu/cbecs/cbecs2003/ detailed_tables_2003/detailed_tables_2003.html#consumexpen03> Table E1. 3 Perfette, Mike. "Night Ice: Thermal Energy Storage Advantages to the Electricity Grid." District Energy - IDEA Centennial Conference, June-July 2009. Web. 10 Aug. 2009. <http://www.districtenergy.org/2009-07-10-files/powerpoint/3B1_Perfette.pdf>. 4 Mike Perfette (Director, Operations and Maintenance of Northwind Phoenix) presentation at IDEA Centennial Conference "Local Energy, Global Solution"